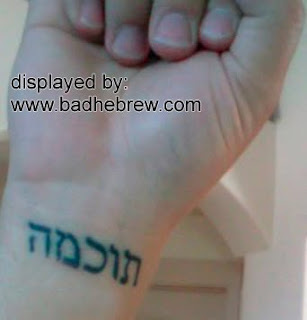 Bad Hebrew Tattoos: So You Think You're Wise? Maybe Wise Willie should have gone with plain old 'WISDOM'. As he grew older (and larger) it would read "W IS DOM". But seriously, as a native speaker(?) I see 'Tochmah' as a new form of wisdom, coming from deep within ('me'toch') one's soul. He just needs to explain that to the less enlightened. Or change the taf to a het, whichever's cheaper. What about changing the MEM to NUN, Then he would have a "SOFTWARE" tattoo.